This song too cannot be divorced from the theater that is live rock n roll and Bono’s skills as a rock ‘n’ roll frontman. Their mastery of the performative in rock’s transcendent scope is why U2 is the greatest rock ‘n’ roll band to date. Their soaring belief in the power, as they sang, of “a red guitar, three chords, and the truth” allows them to harness this transcendent reach of rock ‘n’ roll in way that no other band does with the same consistency. They are masters of the theatric and the performative and have spun their experiences into a body of work with an audacious reach beyond the limits of the present. No doubt, it sometimes misses in overreach. But when it connects one can be transported out of oneself to consider something bigger, grander, and “to come” in the biblical sense of an eschatological horizon akin to a “New Year’s Day.” But seeing this horizon is difficult in the midst of the raw matter of human life together. It is in this real context that U2 has been able to plumb rock’s depths of expressing anger, hope, and redemption. With its plaintive cries for a future beyond our destructive selves, “Sunday Bloody Sunday” is such a song. 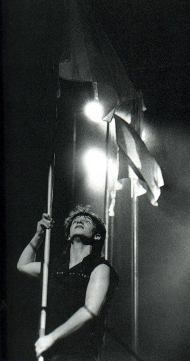 In a 1987 World in Action documentary for Irish television, the Edge observed that “a lot of people think rock ‘n’ roll should be escapist, but why shouldn’t it face what is actually happening?” For a group of four young men coming of age in the midst of “The Troubles,” this question was both urgent and daunting. 1983′s “Sunday Bloody Sunday” was a bold answer. It teems with raw fury capturing the zeitgeist in which the post punk Irish quartet emerged. In the same documentary, Bono admits that, “We wrote ‘Sunday Bloody Sunday’ in a rage.” The rage is palpable in the pounding drum beat and the exasperated exhaustion of the opening line. And yet, it balances its analysis of the human condition (“trench is built within our heart”) with a horizon of hope (“tonight we can be as one”). The flag is a universal symbol of the cessation of hostilities and maybe a particular reference to the Irish Catholic priest, Edward Daly, who waved his white handkerchief aloft as others carried the unarmed wounded to safety in 1972′s horrific killing of 14 protestors in Derry, Ireland by an elite British paratroop regiment. U2′s use of the sonic and the visual connect concertgoers to a broken world. This version has a youthful exuberance that buoys the edginess of the song. There is a generational pushback that proclaims a prophetic NO to the cycle of violence. It embodies the headiness of youth spurred by dreams of changing the world. But, as the lyrics lament, “how long must we sing this song?” As young people navigating our enlightenment with our restless energy, we can be tempted to think that our attention alone is enough to wrest history from the violent. Yet this song is a staple of the band’s canon and a fixture within their live shows. heir continuing relevance as four (now aging) lads bearing the self-professed mantle of “three chords and the truth” emerges as they successfully prevent the song from being a nostalgic greatest hits performance. Instead, the performance evolved with the band’s own expanded gaze. Birthed from “The Troubles,” it has come to speak to Beirut and Nicaragua, Soweto and Sarajevo, Baghdad and Tehran, and beyond. Juxtaposing it with the raw, new track “Raised by Wolves” serves as forceful reminder of the harsh context in which this hope must be spoken and lived with a vulnerable courage. It is a world in which the fervor of our beliefs can be twisted in on ourselves and spring outward in a bloody “purification” of those who oppose us. It is a world in which the cry from the new song, “I don’t believe anymore…” is both an expression of exasperation at nihilism and a prophetic refusal of causes and crusades no matter how religiously infused. Thirty two years on from its first performances, this song is still “not a rebel song,” but is a call to all of us to face the human condition without blinking and with sober, relentless hope. It is not resignation to the inevitable but a call to action. As Bono invited in U2 Go Home: Live from Slane Castle, “…if you’re the praying kind, turn this song into a prayer.” It is lament. How long? It is petition. No More! It’s shrill and stilling focus on violence somehwere remains a prayer for an end to violence everywhere. Amen.